Nebulous Notes is an iPhone, iPad and iPod touch app from Nuclear Elements that lets you view and edit text files stored on your Dropbox account. Using Nebulous Notes is pretty simple. 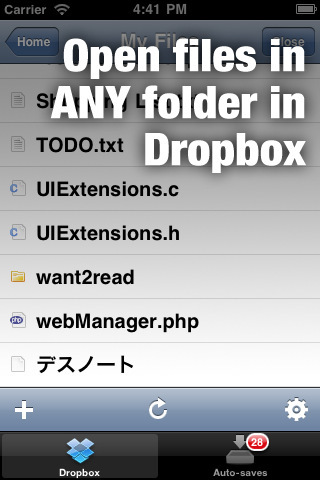 You just enter your Dropbox account information and the app loads all your files and folders into view for browsing. You can go into and out of folders and find any text based file for opening. Tap top open the files and Nebulous Notes downloads the file from Dropbox to your iPhone or iPad for local editing. You can either edit existing text files or create new files using Nebulous Notes. When you’re done editing tap the “upload” button to send the files over to the Dropbox cloud. Nebulous Notes has an auto save feature that keeps local copies of your changes for offline editing, which are auto-saved every 5 seconds and upon exit. These files are linked to your Dropbox account, and can be uploaded anytime you are ready. Nebulous Notes adds a function bar to the keyboard for editing text files which includes basic macros for punctuation and characters used in programming languages and writing such as curly braces, angle brackets, tab, page up, page down, move right, move left, move up, move down, as well as date and timestamp buttons. You can also add other macros like some very basic html tags to the macro bar. Other settings include customizable brightness, font size, font type, text and background color and also a set of 4 predesigned themes to choose from. Finally, if you already have TextExpander app installed, you can use that in Nebulous Notes for quick copy insertion shortcuts. There is currently no syntax highlighting feature built into the app, which would be great for developers using this to edit code. The app also does not have the ability to edit rich text formatted files, only plain text at this point. Open files can be printed or emailed (as PDF attachments, as inline text or as attached text) using the app. There is a fullscreen mode that hides the toolbar, which is great in landscape mode. 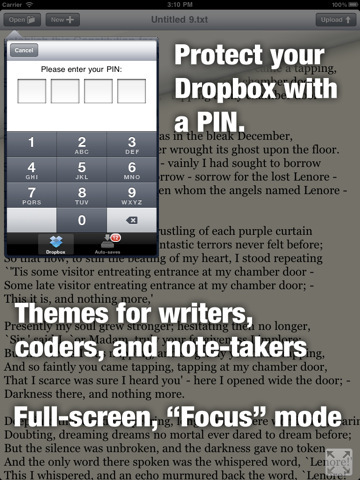 Overall, Nebulous Notes is a handy app for editing pure text bases files via Dropbox integration. If you find yourself needing to edit the same text file on your Mac, iPhone, and iPad, this app can help you keep a running synced workflow across all your devices. Great for active authors, writers, and coders. AppSafari review of Nebulous Notes was written by Joe Seifi on December 26th, 2010 and categorized under App Store, Developers, iPad apps, Notes, Productivity, Universal, Utilities. Page viewed 4827 times, 1 so far today. Need help on using these apps? Please read the Help Page.